Johnny Appleseed? Why Johnny Appleseed? Here’s why: I have twin grandsons enrolled in kindergarten. They are 5 now and starting to figure out the world. Apparently one of them (they’re in different classrooms) has been learning about Johnny Appleseed’s exploits, something that always fascinates children. I remember being very interested in Johnny Appleseed when I was about that age, but I got over it. The boy also learned that after spreading all of those apple seeds, Appleseed died at the ripe old age of 70. It prompted him (my grandson, not Johnny Appleseed) to question his mother about the relative ages of his relatives, including grandparents. It turns out I am the oldest person in his extended family, two years older than a presumably healthy guy like Johnny Appleseed was when he died. 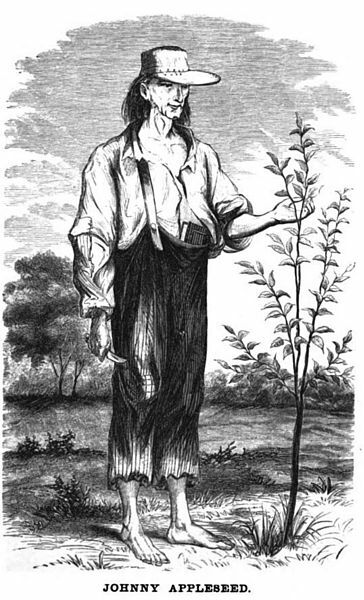 Here’s this great historical figure who trekked through Ohio, Indiana and Illinois planting apple trees along the way – could a healthier lifestyle be imagined? – dies at 70 and a sloth like me, who doesn’t even eat apples, is still going strong at 72. Yup, life is unfair, but I’m not complaining. It never does any good. A recent road trip took us to a wedding held in an Indiana corn field and the homelands of two American icons, James Dean and Frank Lloyd Wright. And... we had some wine and cheese along the way. When we travel long distances by car, we generally pack a bottle of red wine, a box of snack crackers and some cheese. Then, at the end of a long day of driving, we can relax in our hotel/motel room with a glass of wine and hors d’oeuvres before going out to dinner in a restaurant. We just returned from such a trip – down to central Indiana by way of Wisconsin and Illinois for a family wedding. Very nice trip at this time of year, if a little agriculturally oriented in this section of the country. If you think Iowa is where the tall corn grows, you ought to try Indiana. Illinois is no slouch either when it comes to growing corn. Tall corn stalks everywhere. So after miles and miles of cornfields, come evening it is good to stop, check into overnight accommodations, pour a glass of wine, slice the cheese, slap it on a cracker and reflect. We had quite a bit to reflect about on this trip. Aside from the family obligations, it was devoted to a pair of American icons we met along the way. The first was the actor James Dean, whose hometown, Fairmount, Indiana, was just minutes from our family gathering. We stole a couple of hours alone and went to the Fairmount museum devoted almost entirely to Dean. It is chock full of James Dean memorabilia, ranging from things he wore, to motorcycles he owned to letters he wrote and movie contracts he signed, together with hundreds of photographs depicting his youthful days in Fairmount through his New York and Hollywood years, and back to Fairmount where they buried him in 1955 at the age of 24. It gives you pause. At least it gave me pause. Dean became a famous movie star when I was in high school, an instant teen idol, and he was killed in a sports car crash when I was still in high school. He made a big impression on my generation, appearing in just three movies: “East of Eden,” “Rebel Without a Cause” and “Giant,” all released during my high school years. You wonder how this kid from a very small Indiana farming town could establish himself as a genuine American icon in just half a dozen years after graduating from high school. He shows himself to be a fine, even brilliant, actor in those three movies (and several television productions, mostly before he became famous), but brilliant actors bubble up every so often, not all of them becoming icons and remaining household names 56 years after dying. At the Dean museum, I spoke with what could only be described as an aged woman. White hair, wattled skin, portly figure, cane to steady her when she walked. She said she’d gone to school with Dean, a few classes ahead of him. You wonder, how could this young, vibrant guy have gone to school with this old lady, but, of course, looks and generations are deceiving. Dean would have turned 80 this year. Amazing. Next stop? Several hundred miles northwest, in Spring Green, Wisconsin, at the home of the architect Frank Lloyd Wright – another American icon. Taliesin, as Wright’s home is called, is an imposing structure near the top – but not on the top – of a hill near the Wisconsin River, with a panoramic view of other hills, farm fields (yes, some corn) and winding roadways. Wright’s colorful life is reflected in the home’s unique design, including some baffling qualities such as low-hanging doorways and passageways. It’s been said Wright was not concerned with people taller than he, who might bump their heads on the doorframes. People like me. Oh, there’s so much to say about Frank Lloyd Wright that people either already know or don’t care about. 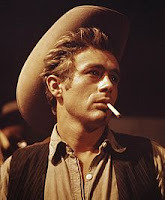 But like James Dean, he’s an American icon, although there’s one big difference. Dean achieved this rare status by the time he was 24; Wright slowly achieved his icon status over 91 years. Time to return home to Duluth, with one last stop along the way: Baraboo, Wisconsin, the logical place to spend our last night on the road. Baraboo, not far from Spring Green and cheek by jowl with the Wisconsin Dells, is the home of another iconic American family, the founders of the Ringling Brothers circus empire. We didn’t visit Circus World there, opting instead for a glass of wine and a few pieces of cheese on crackers. But by then the cheese was very soft, having been kept at car temperature for many miles. So we left our cheese in Baraboo. Not everyone can say that. No cheeseheads we. It's almost here... the visit from Norway's royalty to re-dedicate Enger Tower on October 17th. (Read more about it in the Duluth News Tribune HERE.) King Harald V and Queen Sonja of Norway will arrive for activities with local Norwegians and a re-dedication of Duluth's Enger Tower. 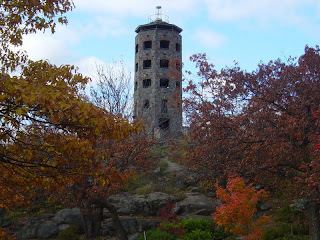 As you may remember from a previous post (read it HERE), I took the opportunity to climb Enger Tower coincidentally on the very date that it was originally dedicated by then Crown Prince Olav and his wife, Princess Martha of Sweden, 70 years before. That day I noticed the plaque adorning the inside of the tower wall commemorating the dedication 70 years ago. Of course, since that June visit at Enger, the tower has undergone some needed structural improvements and efforts have been made to upgrade the tower and park (see HERE). If you have never visited visited Enger Tower and Park, you ought to. 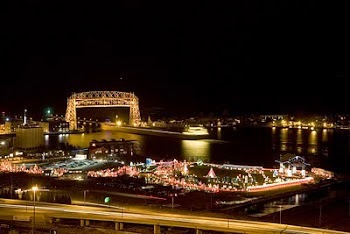 It's a gorgeous park on the top of Duluth's skyline and the vistas of lake Superior and our fair city are fantastic. It's a great place for a picnic too. Enger Tower also has new lighting that shows it off in our evening skyline, thanks to a project from local Rotarians. King Harald V was only two years old when his father, then Crown Prince Olav, and his mother, Princess Martha, came to Duluth for the original Enger Tower dedication. During WWII, Crown Prince Olav was forced to lead his government in exile and Princess Martha and their children (including Harald) lived for a while in the White House as guests of the Roosevelts. Much is written about Princess Martha during that era, especially in the Pulitzer Prize winning biographical account of Franklin and Eleanor Roosevelt on the home front in the war, "No Ordinary Time" by Doris Kearns Goodwin. The current movie “Contagion” is about what the title implies: How a global pandemic is caused when a virus that has no known remedy spreads from person to person until millions are infected and who knows how many are dead. Two percent of the world population is mentioned. And in this fictional treatment of an alarming worldwide emergency, we are not spared. We means Northeastern Minnesota. Here’s how. Part of the film is set in Minneapolis, where one of the stars, Matt Damon, resides with his wife, played by the actress Gwyneth Paltrow, who returns from a trip to Hong Kong with the virus and the threat radiates out from her. The lissome Paltrow doesn’t seem to worry much about her image as a great beauty. She is seen throwing up some awful looking fluid just before she dies of the virus. Nice to see we’re not forgotten when it comes to a deadly worldwide pandemic. It’s an engrossing movie, though. Highly recommended. But if you do go to see it, be sure not to cough in the theater. 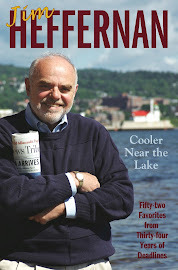 It is not comforting to pick up your local newspaper – in this instance the Sept. 2 Duluth (Minnesota) News Tribune -- and read the headline: “Risk of dying is greater in the Northland.” (Read HERE) I have seen the Northland and it is us. Yes, various government agencies that collect statistics on who dies of what and where report that Northern Minnesota (AKA the Northland) is the unhealthiest place to live in the state, with mortality rates for diseases like cancer and conditions like heart trouble vastly exceeding those in other regions. Also cirrhosis of the liver, an accurate measure of the drinking rate. The mortality rate is the chance that a given person will die of any cause in the course of the year. It should not be confused with the “morbidity rate,” which measures the frequency with which a given disease appears in a given population, and also the number of horror movies shown in a given year at a multiplex near you. Still, I believe we in the Northland should not be greatly alarmed by such headlines and statistics. There are more diseases than cancer and heart trouble, after all. We should look on the bright side, focusing on the morbidity rate, which these government agencies actually fail to mention at all. Accordingly, I believe it is safe to say, without conducting any research whatsoever due to lack of qualifications, that there is absolutely no danger of contracting scurvy in the Northland. You remember scurvy. Sailors and pirates got it on long sea voyages when they ran out of fruit. The morbidity rate for scurvy in the Northland must be close to zero, which we can count as a blessing in disguise. So too with beriberi, another diet-related disease having a strong association with long sea voyages, but not on Lake Superior. Statistics would indicate, if anybody ever compiled them, that there is virtually no beriberi in the Northland to speak of, although it could come up among the drinking population, already suffering from cirrhosis. We see no mention of beriberi in Minnesota health statistics at all, heaven be praised. And where is brucellosis in these statistics? We do not see reports that there is any problem of brucellosis in the Northland whatsoever. For those readers who are not familiar with brucellosis, you can get it from animals like goats and cows, but not our good Northland goats and cows, it would appear. Better to read headlines like “Northland almost free of scurvy, beriberi and brucellosis.” Thank you. That might be a refrain for some, but not for me. I don’t expect to twitter in this lifetime, a span getting shorter and shorter for my generation. All this was inspired – if inspired is the word for such mundanity – by a Sept. 1 New York Times column by Frank Bruni (read it HERE) in which he posited that the more ways we have to contact one another, the harder it is to reach anybody. So, I’ve concluded that the trouble with America today is that there are too many ways to contact people, causing mass confusion and widespread frustration, leading to gridlock in Washington, extreme partisanship in Congress and the legislatures, not to mention indigestion. OK, I won’t. There was a time in this sainted land when you could pick up the telephone and a sweet-sounding woman would be there, asking you personally what number you would like to call. “Number please,” she’d chirp, after which she’d ring it for you. All of these women were known as “Central,” regardless of which high school they’d attended. “Hello Central, give me heaven,/ For I know my mother’s there./ You will find her with the angels,/Over on the golden stair.” Yes, THAT Central. 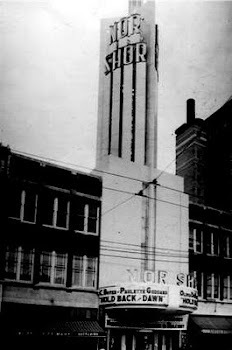 I am old enough to remember Central. Talked to her often as a child, calling my cousins. Their number was Melrose 4819, although sometimes, just for fun, you’d say 481 apple. Get it? Central did not like to be joked with, though. Various parts of Duluth had different telephone identifications. We were always Melrose 4504, but other parts of town had names like Calumet, Market and – get this – Hemlock. What was it that Socrates drank at the behest of Athenians who didn’t like him, resulting in death? It wasn’t Mountain Dew. One bad thing: party lines. I know they sound fun, but they weren’t. They caused a lot of trouble in neighborhoods. A party line is when two or more telephones are hooked up to the same number, so that all phones on the line ring when someone called one of the party. And if somebody was using the line, no one else could call out, but they could listen in. Bad. Very bad. We had one other person on our party line when I was a child, a mean and nasty old woman who would repeatedly complain that we monopolized the line. Looking back I think she was right. And while we were cool toward this neighbor in the party line days, when they ended we became more cordial and realized she wasn’t mean and nasty at all, and very likely went straight to heaven, for I know that she is there, you will find her with the angels, over by … Well, you know. Oh, but I go on with this ancient history. Really, I was going to write about how as an adult I became what I call a phonephobe, which is a person who fears making telephone calls. Utter fear isn’t quite the emotion, but I resist calling and always put calls off if I can. I think this comes from years and years as a working journalist. Much of the news is secured over the telephone. You hear something newsworthy happened somewhere and call someone who was involved. Many of the recipients of the calls were surprised to be called, or didn’t want to comment, or resented the calls, or would chew you out for calling too late. One time I was told to call a civic leader who the city editor said had made a speech earlier in the evening. You do what you’re told, so I called the guy about 10:30 p.m. and asked him what he’d said in his speech earlier in the evening. “What?” he said in exasperation. I reiterated that I understood he’d given a speech and would he kindly tell me what he said so that I could write a story about it for the paper. “That was last year,” he snapped. “I gave that speech a year ago.” Click. You can see why I’m a phonephobe.